Occupy Wall Street is showing solidarity with striking Walmart workers. Walmart workers are planning to mark Black Friday, the day after Thanksgiving and one of the biggest shopping days of the year, with pickets outside of stores and warehouses across the country. Former and current employees of the giant corporation describe systemic abuse and harassment by management at Walmart stores and warehouses. When asked about their demands, many workers talk about the desire for management to respect and listen to the workers. OUR Walmart, a protest group seeking justice and accountability from Walmart, also wants to see the minimum wage raised to $13 an hour and for full-time jobs to made available to “associates” who want them. Other demands include a dependable, predictable work schedule, affordable healthcare, no discrimination and wages that ensure no Walmart worker has to rely on government assistance to survive. Walmart is one of the biggest recipients of government subsidies, receiving tax breaks, free land, cash grants and other forms of public assistance, in addition to paying some of its workers so little that they also turn to the federal government for programs like the Supplemental Nutrition Assistance Program (SNAP). His job is to load heavy boxes, sometimes weighing up to seventy pounds, onto pallets stacked six feet tall in a freezer that has a temperature of minus-twenty degrees. He is also given very short time limits for each pallet to be completed, so he normally ends up running down aisles with heavy boxes to make his rate. One day, he cut a fairly large gash in his leg by scraping one of the wooden pallets and his leg started bleeding. When he asked his manager for a bandage, he was told that if he were given one one, they’d have to write him up for not being careful enough on the job. Instead, he worked all day with an open wound because he was afraid that one more write-up could get him fired. This is part of a system of harassment and intimidation. The worker goes on to explain that Walmart is notorious for telling employees they will be fired upon their first utterance of the word “union,” and they are encouraged to not report on-the-job injuries. If the equipment breaks while they’re using it, regardless of the cause, the employees will be written up. There are four categories of write-ups, and once they get written up four times, they are automatically fired with no questions asked. Dan Hindman has worked at a Walmart near Los Angeles for four years. The former employee of the month, who makes $9.80 an hour, told CBS News that even though he is scheduled to work on Black Friday, he doesn’t plan to show up. “Walmart needs to learn that it’s not fair how they treat us,” Hindman says. “We don’t want to walk out on Black Friday. We don’t want to do this. It’s just something we have to do, because it’s the right thing to do,” Hindman says. He says his schedule was cut to 15 hours per week when he joined a group of Walmart employees who favor unionizing. He lost custody of his four-year-old son when he could no longer support him. 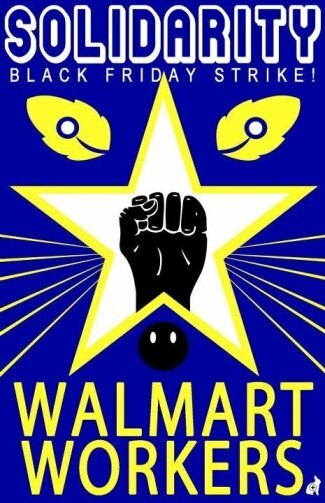 In order to show solidarity with Walmart workers, the Occupy movement has organized a series of grassroots events across the country. A coalition, including Occupy Wall Street, 99 Pickets, ALIGN, Rev. Billy and the Church of Stop Shopping, Retail Action Project and other allies will occupy a Walmart store in North Jersey in solidarity with the workers. But the event is in no way limited to the New York–New Jersey region, and other Occupy chapters are also planning actions. Nick Espinosa from Occupy Minnesota says protesters in Minneapolis are working with Centro de Trabajadores Unidos en Lucha (CTUL), in addition to other community organizations and labor groups, to support local Walmart workers who are going out on strike. “Occupy is serving as a hub to connect people to where workers are standing up and speaking out in ways that they can support them,” says Espinosa. Upon visiting a Walmart store in Mexico, Espinosa says he saw youth who were bagging groceries there for no wages—only tips. While Espinosa doesn’t claim Occupy inspired the recent string of Walmart strikes and walkouts, he does credit the movement for raising awareness about the issues of class and labor abuses. Janna Pea, a spokeswoman for one of the workers’ groups, says she expect some 1,000 of the roughly 4,000 chain stores to be hit with walkouts. I’ll be live-tweeting from some of the Black Friday protests. Follow me at @allisonkilkenny. For more updates on Walmart’s attempts to stop the strike, check out Josh Eidelson’s coverage here.